Hong Kong, October 3, 2018 – Google Hong Kong released the second edition of the Smarter Digital City Whitepaper. The research, conducted by Ipsos, takes an in-depth look at the progress of consumers’ perceptions of a Smart City and their technology adoption in everyday life; as well as the progress of business digital transformation in the past year. The pace of digitalization in Hong Kong presents a conundrum. There has been only a slight increase in the Consumer Digital Index (CDI) compared to last year, but a significant leap in the CDI for the 55 – 64 age group. Only 30% of local residents consider Hong Kong a smart city despite high internet penetration. While 85% of corporates have increased digital investment this year, and 93% said they would invest more in the next two years; only half of the SMBs interviewed see digital as a fundamental part of their business. Despite the publication of the Hong Kong Smart City Blueprint by the HKSAR Government Office of Government Chief Information Officer (OGCIO) and the announcement of HK$50 billion for innovation and technology projects over the past year, only 14% of the public surveyed think the government is significantly investing in making Hong Kong a smarter city, down one-third from 21% in 2017. In view of the aging population, this year’s research looked at digitization in the healthcare sector and consumers’ expectations. Fifty-five percent of Hong Kong residents hope for faster and more accurate diagnoses; 39% are also open to doctors consulting artificial intelligence (AI) and having preliminary consultations with doctors through online chat. To ease the burden on doctors and the healthcare system, stronger public-private partnerships, better trend analysis, and forecasting, and smart use of data and technology application are ways to address pressing challenges and to meet expectations for improved efficiency. Hong Kongers are often hailed for their efficiency. However, even with digital enablement, job seekers often find it hard to filter through a sea of recruitment sites to locate the most relevant jobs to them. Google is adding a new feature called Job Search that provides an improved Search experience to help people find jobs more quickly and efficiently. Job seekers can explore jobs from across the web on partner sites including, but not limited to: Recruit.net, Cpjobs.com, CTgoodjobs, Michael Page, LinkedIn, Glassdoor, Monster, Randstad, and Retired Not Out. This enables job seekers to easily locate desirable jobs, and employers to match jobs with talent more easily. The English version will go live in Hong Kong on October 5, with the Chinese version coming in 2019. Corporates are eager to digitally transform their businesses. However, the digital talent shortage remains a common barrier. Fifty-four percent of corporates consider data analytics to be an important skill for their employees, yet 70% of corporates have difficulty finding talent with a data analytics skill set. Only 14% of Hong Kong residents believe that the city is successfully developing digital talent. According to the Smarter Digital City Whitepaper, policymakers should embed computational and design thinking in primary and secondary school curriculums, as well as promote computer science (CS) learning. Vocational training for teachers and the current workforce is also essential to building the talent pipeline for smart city development. Google has been collaborating with local organizations and supporting digital talent development. Since 2016, Google Hong Kong has worked closely with local nonprofits to localize CS First, a free computer science and coding curriculum for kids. To date, more than 1,000 students have taken part in the CS First program. For the current workforce, this year Google has introduced the Chinese version of Digital Garage, a free digital marketing curriculum, to Hong Kong. Referencing the study findings, 80% of Hong Kong residents have expressed interest in improving their digital skills, most notably in machine learning, app development, and data analytics. To inspire educators and spark interest in AI and Machine Learning, Google Hong Kong hosted AI Bootcamp for professors and teachers. The newly added whitepaper section on the Greater Bay Area initiative (GBA) poses some interesting findings. Only 15% of Hong Kong residents consider themselves to be familiar with the GBA. When asked if they think the GBA initiative may benefit the local technology and innovation industry, only 34% of Hong Kong respondents agreed, far less than their Shenzhen and Guangzhou counterparts (66%). In addition, only half of Hong Kong’s small and medium-sized businesses (SMBs) agreed digitization is an important part of their future, fewer than Shenzhen and Guangzhou SMBs (66%). pportunities in the GBA region. Echoing the government’s strategy to position Hong Kong as a data and insights hub, the Google Cloud Platform region to be available in Hong Kong later this year will help businesses accelerate digital transformation, support ecosystem growth that favors innovation and promote a smart economy in the city. Visit the Google for Hong Kong website to download the full Smarter Digital City Whitepaper 2.0, and learn more about Google’s initiatives to advance Hong Kong’s smart city development. Follow #GoogleforHongKong on social platforms for more information. 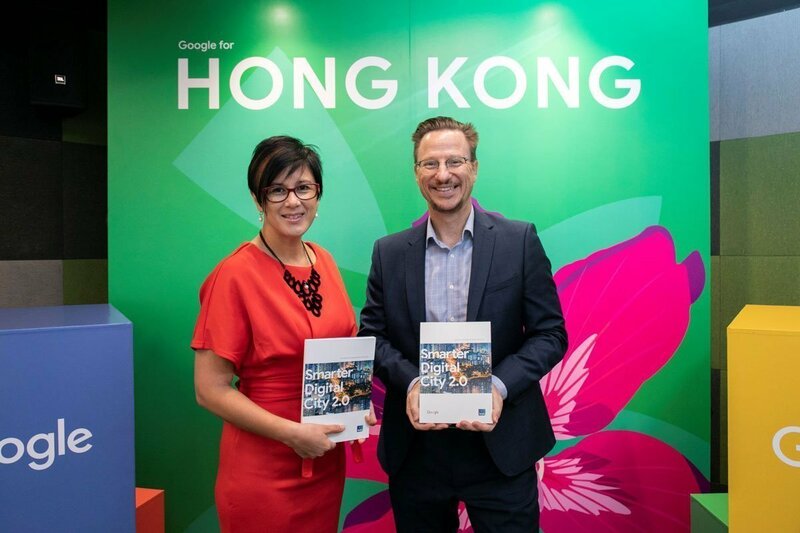 Leonie Valentine (left), Managing Director, Sales & Operation, Google Hong Kong, and Mick Gordon (right), Managing Director, Ipsos Hong Kong, discussed the Smarter Digital City Whitepaper 2.0 key findings and recommendations for Hong Kong to become a smart city. About Smarter Digital City Whitepaper Google Hong Kong commissioned Ipsos to conduct comprehensive research on the progress of digitization in the city across four key business verticals that account for nearly half of Hong Kong’s GDP – Travel, Finance, Retail, and Living (with a focus on Healthcare sector). Google Hong Kong’s Smarter Digital City Whitepaper identifies factors that shape Hong Kong’s digital transformation and offers strategic insights with an aim to help Hong Kong make a leap to become a smarter digital city.